Musical Mana: New Year's Rewind - Back to the 80's! At about 6am on New Years day, after I'd had my fill of the hot tub and the DJ's had given up in the other room, I hit the laptop in Garth's front room to spin 80's and early 90's classic requests as a YouTube DJ. It'd been a long time since hearing some of the tunes, but we'd totally forgotten how jokes the videos to go with them are! 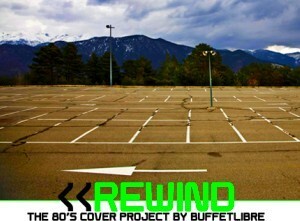 I was delighted to discover then, that last July, LA Electro whores LAZRtag "released the first part of Rewind, a non-commercial project intended as a unique tribute to the eighties and nineties. 60 bands and producers took part in recording exclusive 80’s covers." You can download the songs free from the Rewind website, which has the new cover mp3's next to the original videos. It can be found by clicking here. Tracks vary in quality and style. I've only scratched the surface so far but from what I've heard so far I'd recommend out Hello Tokyo's version of Girls by the Beastie Boys and Mr Miyagi - Where Do The Boys Go.